The second edition Ethics in Audiology has more in-depth information on ethical conduct in clinical, educational, and research settings. This was written to meet the growing need for practical advice on common ethical issues faced by audiologists. Whether you own or work in an audiology practice, conduct research, teach students, or are studying to become an audiologist, you are likely to encounter ethical dilemmas that are difficult to reason through on your own. You are able to earn CEUs from Ethics in Audiology. The chapters and appendices are grouped into nine modules totaling 16 hours or 1.6 CEUs. Modules are worth 0.1 to 0.3 CEUs and may be taken together or individually. Visit the Academy Storeor call 800-222-2336, ext. 1039. Students: Download the Student Order Form now. For more information regarding this program, email us or call us at 703-226-1043. The Ethics in Audiology CEU Program can be used to meet ABA recertification requirements. To earn ABA Tier 1 CEUs a minimum of three hours need to be submitted during the ABA certificant's three year cycle. 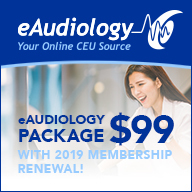 In addition to having the ability to earn Tier 1 CEUs, you can also fulfill the ABA three-hour ethics requirement (required in a three-year certification period) by reading Ethics in Audiology. For more information contact the ABA. Registration includes a login to the online assessment for each selected Module. To purchase "Ethics in Audiology", please call 703-226-1039 or visit The Academy's store. Visit the Academy Store or call 800-222-2336, ext. 1039. Students: Download the Student Order Form now.